A video camera pans across the wide open spaces of a summer paddock. Amateur footage shows a throng of people in pants tie-dyed and jeans faded, hair wild and feet bare. They are moving in their own worlds to the music sounding from speakers set on each side of a makeshift stage. Between them, sitting amongst a maelstrom of microphone stands and instruments, Shane Philip is doing what he does best. 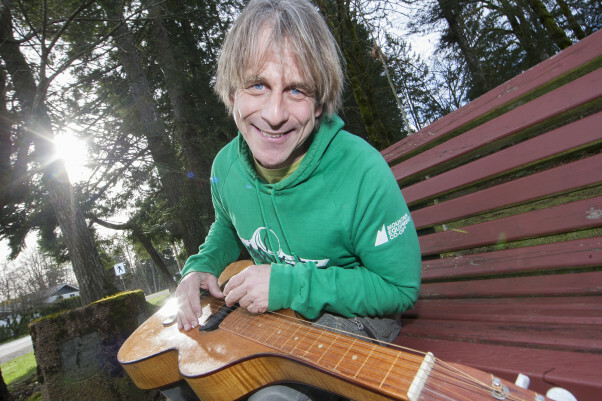 He sings and plays a weissenborn-style acoustic lap guitar, one foot kicks a driving base rhythm on a metallic pedal and the other foot bounces along to the melody. In front of him sits a handsome wood-carved djembe, and beside that a slender, serpent-like didgeridoo crests in a forked stand, the bulbous end resting an inch off the floor with a microphone waiting to capture and propel the earthy tones. Around him is an assortment of percussive bells and shakers and cymbals, and a harmonica on a neckstand. The camera follows Philip’s fingers strum across the strings and press and release on the fret board, occasionally singing, then his mouth moving to and from the bees-waxed didgeridoo mouthpiece, all the while his eyes roaming the audience to gauge the mood and the energy of the gathering before him. It once was a very familiar sight for Philip, a multi-instrumentalist one-man show, who possesses the sublime ability to weave such instruments and lyrics into a kind of primal, visceral force, capturing both a landscape of togetherness, goodwill, and global harmony through his words with a thumping back groove behind it. Cut to the present day, in a local Tin Town Café in Courtenay, surrounded this time by a small video on a miniscule tripod and a Smartphone, his new toys of choice, his newfound creative direction. Wiry, sun-soaked and sandy-haired, he looks as though he’s straight from the beaches of Tofino on a long August day. One can’t help but notice a quiet alertness, as if he’s taking in the place, the room, and the people in it without acknowledging so. When he talks there is an obscure yet compelling mix of the old and the new, of tradition swirled with technology. He has the afterglow of someone living life in the moment, someone genuinely doing what they love to do. We talk of caffeine, chords and lyrics. We joyfully juxtapose to memories of our respective youths and reel forward again to the here and now. He tells me he has a five-year-old son and that his touring days—all 10 years of them—are, for the most part, behind him. I tell him I too have a five-year-old son and somehow, without need for addition, we forge an immediate connection. 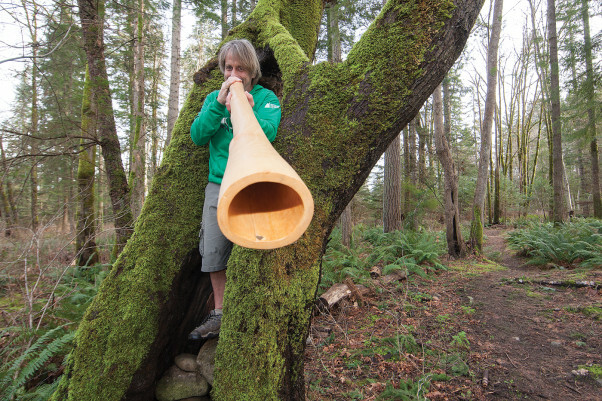 For Philip, his creative journey seems both an intentional and somehow accidental odyssey, a path that has seen him traverse the breadth of Canada numerous times in a loaded minivan of instruments, speakers and stands, then move to Quadra Island, and most recently, to settle in the Comox Valley. The music in him all started when he was a boy, when his persistent banging on the kitchen table earned him the derision of his father. “Dad just hated it,” he says. In his annoyance, the older man overlooked the creative inspiration and processes at play in his son. His Grade 7 music teacher, an accomplished guitarist, saw willingness and potential in the boy and tutored him in the art of strumming and finger-picking. At lunch-hour, Philip would wander off to the music rooms to learn about and soak in the magic of sound. As the years passed, a worldly awareness and deep appreciation of his surroundings subconsciously took a firmer hold on him. He began to write words and melodies that reflected this sense of belonging and attachment to the land. A deep social consciousness began to frame his entire work. For all the guitar progressions, droning didgeridoos, thumping djembes and percussive nuances, his words and melodies about our earth stand at the forefront of his music. They have the capacity to linger long after the songs end. In fact, in some ways his songs are a call to arms, a gentle reminder to stop and take notice, to enjoy our surroundings, to treat nature with the respect and dignity it deserves, and to safeguard it for future generations. “Seeing the world through white-water is a beautiful thing. The chaos of all this rushing water around you; the silence within that wall of sound. To be able to manoeuvre yourself on a kayak in amongst these crazy environments you really need to remain calm and focussed. It’s so energizing. When I’m writing a song, I try to make it happy, to focus on positive experiences like this without the doomsday element. The bright side of life, you know—we must be able to see the bright side of all this,” he adds. In many ways it was a natural segue from song writing to film-clip creation, and then videography. “It’s the same creative part of the brain, making music and making movies,” Philip explains. Nowadays his musical instruments are partially boxed and stacked and in their place are the tools of his new trade—his computers and numerous video cameras, including his favoured GoPros. He began this new direction by making film-clips for his own songs, then when he “became bored with another Shane Philip song” he branched out and began looking for new subjects. He has made music videos for other artists, for music festivals, several short documentaries, as well as working alongside local Comox Valley businesses on promotional material. Importantly, the environmental element of his work has not been forgotten. His videos often feature local flora and fauna and natural landmarks with the aid of multi-dimensional lenses, such as a fish eye perspective, which add aesthetic scope to his work. When asked to elaborate on his motivation for doing what he does, he utters the words, “personal crusade. To that end he says that he feels compelled to further explore nature, to bask in the natural highs it brings him and his family, to protect it and share it with others. Whether through auditory or visual means, Philip hopes to further expose the beauty of life and revel in all it has to offer. hair wild and feet bare. They are moving in their own worlds to the music sounding from speakers set on each side of a makeshift stage. When most people think of screen printing, what likely comes to mind are common goods such as T-shirts, cloth bags or art prints. But according to Andy MacDougall, local yet world-renowned screen printing guru, screen printing is about much more than textiles or art. Considered the world’s most versatile print medium, screen printing is futuristic and present in most electronic consumer products. And knowledge of this not so humble form of printing may be just what some of our youth need to secure them a solid future, either as an artist or working in the high-tech manufacturing sector. Also known as silk screening, screen printing is a 2,000 year old form of printing that was first used by the Chinese, specifically the Sung dynasty period of around 12 BC. Screen printing simply involves the passing of ink or any other printing medium through a mesh or screen that has been stretched on a frame, to which a stencil has been previously applied. The stencil openings determine the image that will be imprinted. The simplicity of screen printing makes it more versatile than traditional printing techniques. The screen printed surface does not have to be printed under pressure and different inks can be used to work with a variety of materials. As a result, screen printing is used in many different industries, including medical devices and printed electronics such as circuit boards. This morning you probably used several electronic devices that were created using screen printed technology. When your Smartphone woke you up the touch screen you swiped to turn off the alarm was screen printed using special photosensitive inks. The control panel on the microwave oven that heated your coffee was also screen printed. And so was the de-fog apparatus on your car’s back window. Screen printing is perfect for manufacturing high-tech components because it allows the printing of fine wiring so tiny it is a fraction of the diameter of a single human hair. Screen printing may even play a part of our energy crisis solution. “Screen printing is an integral part of the manufacturing process for many types of ‘future’ energy systems, including solar panels and hydrogen or other types of fuel cells,” MacDougall says. Clearly, screen printing is no longer a fringe process. In fact, some experts place the value of screen printed products at $9 trillion annually. The Smartphone industry alone represented a $66 billion industry in North America in 2012. “I’d say a rebirth is going on,” says MacDougall. Considering the high-tech uses of screen printing these days, some could call MacDougall a visionary. MacDougall began work in the screen printing industry in 1979. “After I learned the ropes I ran a print shop in Vancouver from ‘84 to ‘93,” recalls MacDougall. MacDougall’s shop printed material for corporations like Chevron, such as signage and other promotional material. During those early years MacDougall also began printing North West Coastal Art. “I really enjoyed printing the art because the art was always appreciated. It was printed to be kept and enjoyed forever, unlike my corporate clients who expected their signage to be tossed away after the promotion was over,” he says with a laugh. Over the years MacDougall helped screen printing in British Columbia grow into a vibrant industry. He printed many firsts, such as the first Kevlar hockey sticks, the first plastic satellite dishes, and MacDougall was the first in Western Canada to print computer disks. Eventually, MacDougall decided he’d had enough of the corporate world and the big city. He moved to Royston where he could use water based inks exclusively and experiment with solar exposure. He created a small studio and teaching facility called Squeegeeville that now attracts students from across North America and as far away as China. MacDougall also wrote the influential how-to text, Screenprinting Today – The Basics. This popular training manual for beginner and intermediate students of screen printing is currently known as the ‘bible’ of screen printing and is used around the globe. In addition, MacDougall, along with Swiss author Guido Lengwiler, has just recently completed the 500 page, fully-illustrated History of Screenprinting. MacDougall is considered a master of screen printing technology and is sought after by organizations and corporations for his expertise. He regularly travels to Europe and the United States to set up design spaces and print shops in colleges and universities. In addition, corporations such as Nike and Facebook have asked his advice when creating print facilities. “Nike called because they needed me to help them build an in-house screen printing studio for their designers. In the end I helped them set up a 6,000 square foot ‘maker lab’ at the Nike Portland Campus.” Closer to home, MacDougall was instrumental in helping North Island College create their new TexMakerLab, where he will also teach courses. MacDougall enjoys a fascinating and rewarding career in screen printing, and now he’d like to make it possible for the youth of the Comox Valley to do the same. In 2013, with the help of local First Nation artist Andy Everson and the Comox Valley Art Gallery, MacDougall teamed up with the Wachiay Friendship Centre in Courtenay to establish a screen printing studio that would support young artists as well as the creative spirit. Specifically, the Wachiay Youth Screen Printing Project was created to introduce local youth to the basics of Coastal First Nation art styles, and to assist them as they create limited edition prints and decorate T-shirts using the screen printing process. The initial program was a great success. The next phase took place during the summer and fall of 2014. This phase introduced the core group of students to an entrepreneurial and business component of design and screen printing skills. “In order to explore the roles and requirements within a production based design company, the students collaboratively created a social enterprise called One Tribe Design and Screenprinting,” explains MacDougall. MacDougall believes that programs such as these can be an avenue for youth to enter into an industry that can provide a rewarding and lucrative career. “One of the biggest hurdles screen printing as an industry faces, in North America and worldwide, is finding trained workers in order to use it properly and efficiently,” he says. The Wachiay Screen Printing lab will also be a place for budding artists to practice their trade and learn the necessary skills to produce and market their work. At Wachiay, the younger artists will get to work with the established artists—a master and apprentice relationship. In addition, the program will introduce important business concepts, such as production scheduling, inventory control and marketing. The program has also received the attention and support of groups from around the world and closer to home. “We’ve received assistance from the BC Arts Council, the First People’s Cultural Council, the Community Justice Centre, and corporate support from Speedball Art Products of Statesville, North Carolina, Sefar USA of Buffalo, NY, and Fimor of LeMans, France. All these people are excited about what we’re doing here.” Support and encouragement are also offered by SD71, since high school students enrolled in the program are awarded credits for the course. This year a new group of students was able to attend the popular after school program at Wachiay, and the current group of designers and printers who make up the One Tribe Collective were able to mentor the new students and share their skills with elders and people of all ages who want to learn screen printing design. “The Wachiay lab is a facility where people can experiment with their ideas,” MacDougall says. For more information on Andy MacDougall, visit www.squeegeeville.com. For course information call 250-334-5005.
local yet world-renowned screen printing guru, screen printing is about much more than textiles or art. Considered the world’s most versatile print medium, screen printing is futuristic and present in most electronic consumer products. And knowledge of this not so humble form of printing may be just what some of our youth need to secure them a solid future, either as an artist or working in the high-tech manufacturing sector. The Comox Valley is arguably one of the most peaceful places on earth. In our ‘land of plenty,’ we have a functioning judicial and law enforcement system, an array of formal and informal support systems, and a relatively stable society. But we still have conflicts. We have bar fights, child custody battles, and heated arguments about parking. We have disputes over dogs, property lines, money, sexual conduct, language, environmental issues, workplace relations and much more. And although we mostly manage our conflicts pretty well, they are often messy, sometimes expensive, and always demanding. Can we even imagine how conflict would play out in Rwanda, a country still unhealed from a brutal genocide 20 years ago that took the lives of an estimated 1,000,000 people? A country where your neighbor may be the person responsible for the murder of your whole family; where the legal, educational and economic systems are in disarray; where genocide has left a legacy of refugees, orphans, AIDS, and demolished villages, as well as psychological scars and social divides too deep for most of us to comprehend? Can we even begin to wrap our heads around the levels of pain and anger, and the potential for violence? If there’s anyone in the Comox Valley who can say yes to that question, it’s professional mediator George Brose. Brose has become intimately familiar with the contours of conflict in post-genocide Rwanda through his experience as founder of The Rwanda Mediation Project, a program that provides mediation training in Africa. Brose and colleague Adrian Symonds, a Comox Valley parent-teen mediator, are currently raising funds to spend the month of August in Rwanda offering training. This will be the fifth such trip for Brose, and the first for Symonds. When the two of them fly home, they’ll leave behind a team of 100 trained mediators who will provide village-level on-the-ground peaceful conflict resolution in their communities. Both men donate all the time they spend on this project—an intense full-time month in Africa, and countless hours here at home organizing and fundraising. But when they speak about the work, they talk not about what they are giving, but what they are receiving; not about how grim the Rwandan situation is, but rather about how it inspires them. “I started out motivated by curiosity,” Brose explains. He wanted to learn how, with the weight of a horrifically violent history resting so heavily on them, Rwandans could manage conflict without genocide re-occurring. What he saw moved him deeply. “I saw that it was possible to survive not just physically but also psychologically. I saw forgiveness. Seeing all that—you end up feeling awe. “For instance, one of the guys I trained as a mediator in Rwanda told me he’d lost 43 members of his family during the genocide. It lasted 100 days, the genocide. During that time he hid in a swamp. He’d come out at night and forage for food. He lost his wife and kids and many others. After peace was made he was so consumed by hatred it was killing him. After three or four years of this he went to the prison where the guys who had killed his family were and asked to meet with them. At that meeting, he begged the killers to forgive him for the hatred that consumed him. The Rwanda Mediation Project is a partnership between two organizations, each with deep roots in non-violent conflict resolution. In Rwanda, a Quaker organization, The African Great Lakes Initiative, sets up the training sessions, recruits and screens students, and takes care of Brose and Symonds’ accommodation, safety, and other needs. Here in the Comox Valley, the project runs under the auspices of the Comox Valley Community Justice Centre (CJC). This non-profit organization, founded in 1998, runs a variety of programs to promote harmonious living and non-violent solutions to criminal and other hurtful conduct. They are known for their restorative justice program, which offers an alternative to the court system, focusing on rehabilitation of the offender through reconciliation with victims and the community. Over the years, this program has helped approximately 2,000 Comox Valley residents—youth and adults—talk face-to-face with the people they’ve hurt, hear about and accept responsibility for the harm they’ve caused, and offer sincere apologies and restorative action, often in the form of community service. Both Brose and Symonds are volunteers with the CJC. 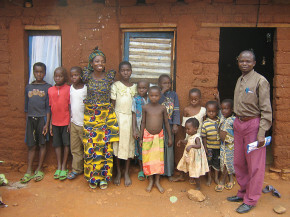 The Rwanda program’s genesis reflects Brose’s long-term involvement with Quaker programs as well as his established connection to Africa. Before becoming a mediator in the late 1990s, Brose had trained as a facilitator for the Quakers’ Alternatives to Violence Project, which takes peace training into prisons. This experience was life changing and motivated him to study mediation. He is not a Quaker and points out that the program is not aimed specifically at Quakers, or any other religious group. The genesis of the Rwanda Mediation Project came one day when Brose was at home (at that time, Ohio) on his computer. He entered into a list-serve discussion with a young Rwandan man who wanted to become a mediator to help his community. Brose knew that the Quakers were active in that region supporting reconciliation and peace-making. This confluence of connections and interests blossomed into a collaboration that has taken Brose to Africa four times where, with the help of others, he has delivered training to approximately 380 locals in Rwanda, Burundi, Eastern Congo, Kenya and Tanzania. Students typically range from farmers to politicians, and all have demonstrated community leadership in some way. After they complete the training, they provide mediation on a volunteer basis in their communities. During their month in Africa, Brose and Symonds will provide four training sessions, each three days long. The trainees learn quickly and are usually called upon to put their new skills to work right away. “The genocide so degraded the justice system there,” Symonds says. George Brose has been to Africa four times to offer mediation training to almost 400 students. His students range from farmers to politicians, and go on to train others who will help make their communities more peaceful for the generations to come. Working cross-culturally is both rewarding and challenging. “For instance, there was a widowed woman in Burundi who’d sold some of her land to pay for school fees,” says Brose. “But this was against tribal law. It should have been her brother-in-law who made the decision. She had affronted him by going ahead without consulting him. In retaliation, it was his duty to have her raped, which he did. There was even a child that came out of that. “The village was in turmoil. It had gone on for three years without any sort of settlement. They had a peace committee there which asked us to mediate it. I asked a man and a woman who had just been trained as mediators to take this on. “Now, normally at a mediation session we don’t have a lot of people. But for this, there were families from both sides, people from the peace committee and others who came to observe. And these two people who had never mediated anything before helped resolve the issue by local standards. The brother-in-law accepted the sale and asked that she host a traditional celebration of a land sale. She said she had no money for this—she had used the money from the sale to pay the school fees. It looked like the whole thing was going down the toilet. But then the guy who bought the property offered to pay for the celebration. “Everyone started crying. There was a collective weeping and wailing and then they started singing and praying and generally rejoicing that there would be peace in the village. Everyone was deeply touched; some confided in me that they hadn’t thought a final resolution was possible. I could have mediated for 40 years in North America and never seen something like that! “What we can do is set up a context for dropping the violence, dropping the antagonism,” explains Symonds. The mediator takes a facilitation role, supporting all parties to have a conversation that leads to a result that is mutually satisfying. Often, the benefits resonate far beyond the resolution of the actual conflict—individual and community wounds are healed, empathy is developed, and relationships are deepened. Symonds and Brose need to raise $15,000 to cover the costs of the trip in August. This amount will pay for their travel, vaccination and accommodation costs, all the costs associated with the training, and honoraria for the students. It’s a remarkably low amount considering what it provides. “The people we train do about three mediations per year. So that’s over 900 conflicts a year getting support. And they are also training others,” says Brose. He estimates that this has created another 2,000 community mediators who are now providing peaceful conflict resolution. The Community Justice Centre is serving as the financial agent for the project. Donors receive a Canadian Charitable Receipt. Please make cheques payable to Comox Valley Community Justice, Attention Rwandan Mediation Project, Suite C2 – 450 Eighth St, Courtenay, BC, V9N 1N5. On a clear but cold day in December, as a horse trailer pulled into the driveway at Sweetwater Stables, an excited crowd gathered to watch intently as the trailer occupant was unloaded. Shortly thereafter, a chestnut mare slowly and carefully emerged—more bones than muscle, more bewildered than brave. The mare’s name is Noelle, and her story is the sort that everyone loves to read—a classic rags to riches tale. Rags, because less than a month before, Noelle was starving in an Idaho field and only a week away from the feedlot and subsequent slaughterhouse. Riches, because Noelle has been given a new home where she will be cherished and loved, celebrated and rehabilitated. The crowd that gathered when Noelle arrived was composed of Heather Stewart and a group of friends affiliated with Sweetwater Stables—all of whom had a part in Noelle’s rescue. 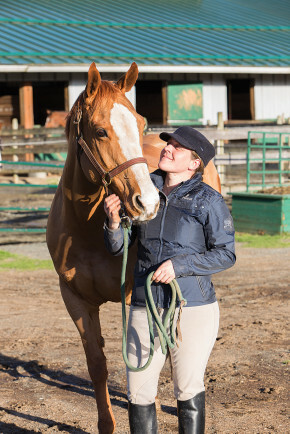 Stewart is the owner and operator of Sweetwater Stables where for more than four years she has overseen horse training, boarding and lessons. Stewart became interested in rescuing a horse when she learned that every year a growing number of healthy horses are sent to the slaughterhouse where they are killed and processed for their meat. In the past, horses going to slaughter were primarily made up of retired racehorses and other work horses who were old and lame. The situation has changed in the past few years, however, and now many horses sent to slaughter are family companions whom their owners can no longer afford. In 2007, horse slaughter became essentially illegal in the United States, but the transport of horses for slaughter remained legal. Horse slaughter is still legal both in Canada and Mexico, and as a result, there’s a steady stream of horses being shipped from the US to its bordering countries. Most Canadians would be surprised to know that our country is responsible for one of the largest horse slaughter industries in the world—only Argentina and Belgium export more horse meat. Canada’s horse slaughter industry, worth more than $80 million annually, is responsible for the slaughter of between 60,000 and 115,000 horses every year and the export of close to 20,000 tons of horse meat destined for dinner tables in Europe and Asia. Canada has five federally registered plants licensed to slaughter horses—two in Quebec, two in Alberta, and one in Westwold, in the interior of BC. When a horse owner is faced with the unhappy reality that they can no longer care for their horse, most make the decision to send their horse to the auction house. Unknowingly, these horse owners could be sending the horse to the slaughterhouse since, according to Animal Justice, as many as 50 per cent of horses sold at rural auctions go to slaughter. Kill buyers, licensed horse dealers who purchase horses at auctions on behalf of the feedlots, regularly outbid legitimate horse owners and rescues at auction, as there is a lot of money to be made in the horse trade industry. In fact, some estimate that kill buyers make $450 to $600 on each horse they buy. Unfortunately for horses like Noelle, the horse slaughter industry makes a greater profit off of healthy horses and therefore purposely seeks out such animals. The United States Department of Agriculture documents that most of the horses being sent to Canada and Mexico for slaughter, more than 92 per cent in fact, are robust and healthy. Unfortunately, the Canadian horse meat industry has become so lucrative that close to 60 per cent of all horses slaughtered in Canada are bred for the sole purpose of being slaughtered for their meat. But it gets worse. Many animal advocates assert that the conditions of horse transport and slaughter are terribly inhumane. For example, horses transported to Canada for slaughter may legally be subjected to as much as 36 hours of transport without food, water or rest. As well, horses are transported in trailers designed for much smaller animals, such as cattle or sheep, forcing all but the shortest horses to travel with their necks bent at unnatural and painful angles. Additionally, horses bred for meat here in Canada are penned in unhealthy and cramped feedlots before they are shipped to the slaughterhouse. The Canadian Horse Defence Coalition reports that Canada has hundreds of feedlots, all crowded with thousands of horses destined for the slaughterhouse. Horses are also being shipped by jet, since Japan is now Canada’s most loyal consumer of live horse shipments. On a regular basis horses are placed in poorly constructed wooden crates—overcrowded and without food or water—and flown to Japan where raw horse sashimi is a delicacy. In fact, the Japanese appetite for raw horse meat has grown hugely in recent years, with live horse shipments to Japan increasing by 562 per cent from 2012 to 2013, making this the fastest growing segment of the horse-meat industry in Canada. For those horses who survive the transport ordeal, the reality upon arrival is even worse. When horses and cattle are slaughtered, they are shot with a rifle or stunned with a device called a captive bolt pistol. Both devices are designed to render cattle instantly unconscious and without pain. However, as horses are more skittish and taller than cattle, both the captive bolt and rifle are ineffective methods for euthanizing a horse. According to animal activists, both the rifle and the captive bolt pistol are oftentimes unsuccessful at killing the horse, and as a result, many horses are essentially slaughtered while still conscious. Though Stewart was aware of the volumes of young horses needing to be rescued she was surprised at how fast she was able to find a quality horse. “I thought I’d have to search for much longer,” she says. “But within days of starting my search I received a tip from a horse professional that I trust.” That tip led to Noelle. Stewart’s colleague had learned of a group of horses in Idaho who were in desperate trouble. The owner was unable to take care of the horses due to health reasons. In fact, the horses were literally starving as she’d not been able to feed the horses for weeks. The owner stated that if she wasn’t able to find new owners for the horses by the end of the week she was going to send them to the feedlot. As Stewart researched Noelle’s situation she soon learned that Noelle was well bred and she even had European stallions in her pedigree. However, it wasn’t only what Stewart read that interested her—it was also what she saw. A big challenge that Stewart faced in finding a horse to rescue was locating one that hadn’t been exposed to an environment, such as a feedlot, that would present a risk to the other horses in Stewart’s barn (feedlots are ripe with communicable diseases). Even though Noelle didn’t spend time in a feedlot, Stewart didn’t want to take any chances. As a result, Noelle was quarantined in Richmond for three weeks before she was transported to Sweetwater Stables. “My first responsibility is always to the horses I already have,” Stewart says. Stewart has only done basic groundwork with Noelle so far, and Noelle won’t wear a saddle for a few more weeks. “Though Noelle started gaining weight when she was in quarantine she was still a bone-rack when she arrived,” Stewart says. Since her arrival in the Comox Valley, Noelle’s rags to riches story has spread far and wide as people throughout North America are following her progress with interest. Stewart credits Facebook for getting the word out about Noelle. “It’s amazing the response I’ve had to the Facebook postings I placed regarding Noelle and her arrival at the barn,” she says. 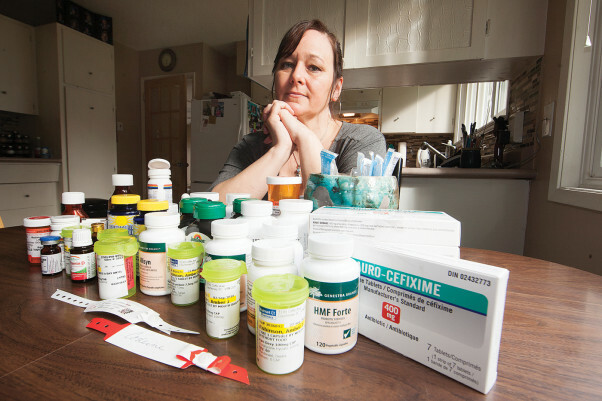 People seem to be touched by Noelle’s story and are interested in her journey towards newfound health. According to Stewart, one Facebook posting received almost 400,000 hits within a few weeks. It also collected almost 9,000 likes, over 1,000 comments, and more than 2,500 shares. Noelle’s fame has spread past Facebook though, as two major American horse magazines have contacted Stewart asking to interview her for a story about Noelle.